When I was researching our visit to De Soto State Park in Northern Alabama, I happened across the guidebook, Five-Star Trails Birmingham. Even though I wasn’t visiting the city proper, the subtitle of the book – Your Guide to the Area’s Most Beautiful Hikes – definitely caught my attention. And I was even more pleased after I cracked the cover and discovered that “wheelchair-access” was noted on each and every hike. Granted it didn’t include the level of access details that I usually note in my publications, but it’s certainly enough to decide if each walk will or won’t work for you. Most of the city center and suburban walks included in the book have a decent level of wheelchair-access, so I definitely recommend checking this guidebook out if you plan to base yourself in Birmingham for a few days. The trails outside the city are another animal all together, as most present more access obstacles. That said, the access is clearly described and at times the author even notes things like “off road tires may be required”, or even details the portion of the trail that will or won’t work for wheelchair-users. And since the walks are very clearly described, it’s easy to picture the terrain along the way. Plus I discovered some accessible things in the book that I’d certainly like to check out in the future, such as the Treetop Nature Trail in Oak Mountain State Park, and the Doug Ghee Interpretive Trail to Bald Rock in Cheaha State Park. 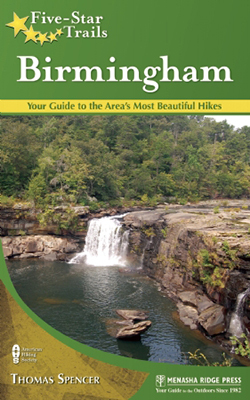 This entry was posted in Book Reviews, Recreation and tagged Alabama, birmingham, city, guide, state parks, trails, walks by Candy B. Harrington. Bookmark the permalink.